The institute on Google Maps. The main entrance of the Konrad-Zuse-House is located in the southeast of the building. 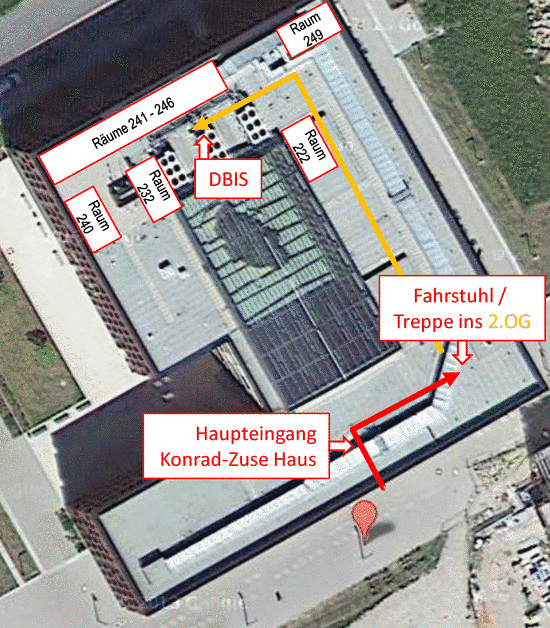 The entrance can be reached directly from Albert-Einstein-Straße (the Konrad-Zuse-Haus is located in "the second row"). From the parking space behind the university buildings (this is located on Campusstraße in the northwest of the Konrad-Zuse-Haus) you must first walk around the building. In the building, the elevator / staircase is on the right behind the main entrance. The offices of the Data Research Group (DBIS) are located in the north side of the building on the second floor. The corridor doors are closed and can be opened with a button on the wall directly in front of the corridor door. After pressing the door button, the access control next to it lights green and the doors are unlocked for a few seconds.